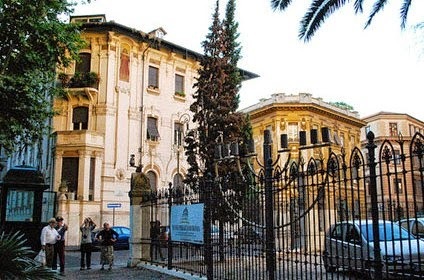 Through this article we’d like to suggest you a unique visit: the Jewish Museum in Rome. Unless we visit this part of the city (the Ghetto) and know the history of Rome’s Jewish community, we cannot understand Rome. It’s very easy to reach the Ghetto from B&B ACQUEDOTTI ANTICHI or from CASA VACANZA ROMA-CINECITTA' FLAT : take the subway metro A (station Subaugusta or Giulio Agricola) and get off at Manzoni station (exit Via Labicana); walk on Via dei Fori Imperiali to Piazza Venezia, pass by the Altare della Patria and take Via del Teatro Marcello; after a few dozen metres turn right in Via Montanara and you are in the Ghetto, a few steps away from Portico d’Ottavia and from the Jewish Museum, which stands in Via Catalana-Largo 16 Ottobre 1943. Jews have been present in Rome for over 2000 years. This presence has encouraged the growth of an intense cultural life and the production of many works of art.The first historical evidence of the Jewish presence in Rome dates back to the II century B.C.E. In 70 C.E. the Community grew with the arrival of the slaves deported by Titus to Rome after the destruction of the Temple of Jerusalem. To this period belong the first Jewish Catacombs ( the one in Vigna Randanini is still visible) and the Synagogue of Ostia Antica, the only one still standing among the ones built during that period. In the Middle Ages, during the papal rule, Rome hosted an important Rabbinical Academy and was a center for the production of precious illuminated manuscripts. 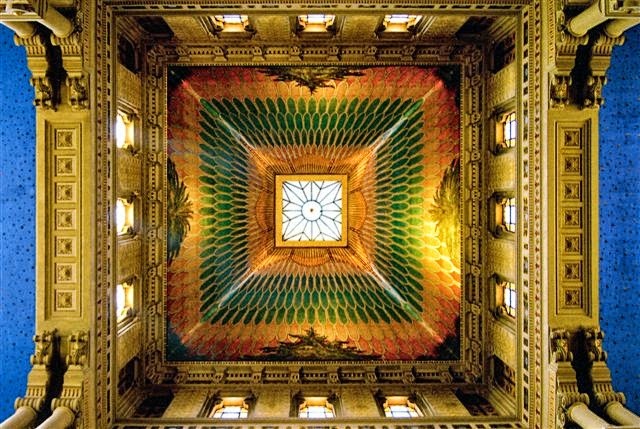 The Jewish Community counted men of science and culture, scholars who were a bridge between Latin culture and Islam. In 1492 the expulsion of the Jews from Spain encouraged in Rome the encounter of two important but different traditions: the local one and the Sephardic from the Iberian Peninsula. The following years saw in Europe tensions and religious wars that caused the worsening of the conditions of the Jews in Rome. In 1553 the burning of the Talmud was ordered. From then on, and for over three centuries, possession and reading of the most important book in Jewish culture was forbidden. This contributed to the cultural decadence of Roman Judaism. In 1555 Pope Paul IV Carafa ordered that all the Jews living in the State of the Church should be locked up in the ghetto: a prison-quarter, in which the Jews were forced to live. They could not own property, they couldn’t work in many sectors of Roman economy or have friendly relationships with Christians. The ghetto of Rome was created on the Tiber banks. The other ghettos of the Pope were opened in Ancona and Avignon. Between 3,000 and 7,000 people lived in the area, depending on the periods, and they had to face many difficulties and the continuous threat of forced baptism. The population was made up of artisans, rag-sellers and poor people, but also of bankers (till 1682) and businessmen selling or renting art objects and furnishings. In the ghetto there were five synagogues or “Scole” depending on the rite and the tradition of their members: the Scola Tempio for the local Jews, the Scola Nova for those that came from small villages of Lazio, the Scola Siciliana for the Jewish refugees from Southern Italy, the Scola Catalana and the Scola Castigliana for the Spanish refugees. In 1870, when the State of the Church fell, Rome became the capital of the Kingdom of Italy and the ghetto was opened and soon after demolished. For Roman Jews it was the beginning of the emancipation: the most visible result of this period was the construction of the Great Synagogue, inaugurated in 1904 and built on the area of the former ghetto. Soon after, the 5 Scole building was demolished as well. The Fascist Racial Laws of 1938 abruptly ended this period of emancipation. From September 1943 until June 1944 the Germans occupied the City and deported about 2000 Roman Jews . In the years after the war the community slowly recovered. In 1967 with the arrival of many refugees from Libya the number of the Jews in Rome grew in a remarkable way and today the members of the Community are about 13,000. In recent times the Roman Jews suffered a terrible terrorist attack in 1982, in which a child, Stefano Gaj Taché z.l. died, and many people were injured – but also rejoiced in 1986 for the visit to the Great Synagogue of Pope John Paul II and in 2010 for the visit of Pope Benedict XVI. The Jewish Community of Rome is today very vital and well integrated in the city life. WE HAVE BEEN HERE FOR FOR TWNTY-TWO CENTURIES. GOT STORIES TO TELL. Located in the monumental complex of the Great Synagogue, the Jewish Museum of Rome opened in 1960 to house the collection of the Jewish Community of Rome: silver produced in Rome between the 17th and 18th centuries, precious fabrics from all over Europe and marbles that survived the demolition of the Cinque Scole in the ghetto. 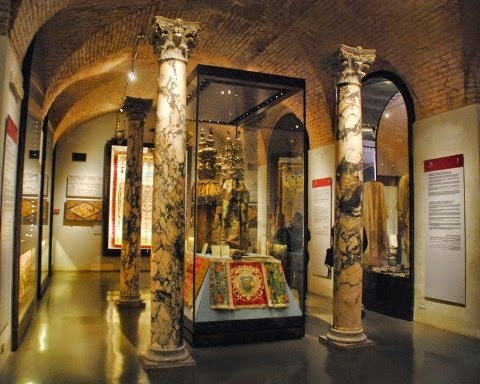 Covering an area of over 700 sq.m., the museum’s exhibits highlight magnificent art objects and preciuos documents that narrate the over two thousend years history of Roman Jews, the relations between the Jews and the city, the contribution of the Lybian Jews who fled to Rome in 1967, and the Jewish yearly cycle and life cycle. The Jewish Museum of Rome is a unique reference point to discover the traditions, religion and history of the Jews of Rome, one of the oldest Jewish communities in the world. Renaissance velvets decorated with threads of gold, embroidery and lace from the Baroque period, French lampas weavings from the 18th century: a world of grace and opulence that has come down to us from the time of the ghetto. The museum owns nearly 800 textiles, some visible in the display cases and others used in synagogues throughout the city. Most are preserved in this room, available to scholars wishing to study them. Impressions of tombstones from the catacombs of Rome and the synagogue of Ostia Antica and manuscripts from the Middle Ages take pride of place in this room. The exhibit is a visual reconstruction of the uninterrupted presence of Jews in the city of Rome for over two millenia. This room is dedicated to the mainstays of Judaism: study, the Sabbath, Jewish holidays throughout the year and the Jewish life cycle. Recurences in the Jewish calendar represented by the objects belonging to the Roman Jewish traditions are here illustrated. Silver objects, precious fabrics and polychrome marbles: this room is tribute to the objects that the Jews of the ghetto donated to theyr synagogues and explains how they are used in liturgical services of the Jewish tradition. From emancipation to present through the Shoah and the reconstruction: artwoks and documents narrate the journey of the Jewish community of Rome, still vibrant after 22 centuries. Documents, items and photographs showcase the history of the one time glorious and vibrant Jewish community of Libya and its contribution to the Jewish community of Rome after the arrival of refugees from Tripoli and Benghazi in 1967. Language and cuisine, urban space and architecture, education and charitable institutions: daily life in the Ghetto of Rome narrated through documents and artefacts. An impressive area that collects marble carvings and engravings dating back to the 16th – 19th centuries, historical evidence of the Jewish community of Rome. Some of the marbles recall the legacy left by wealthy families, others document the purchase of cemetery plots. These headstones were an essential element in the decoration of the Cinque Scole. Sunday –Thursday 10 a.m. to 4.15 p.m., exit 5 p.m.
Friday 9 a.m.to 1.15 p.m., exit 2 p.m.
Sunday –Thursday 10 a.m. to 6.15 p.m., exit 7 p.m.
Friday 9 a.m.to 3.15 p.m., exit 4 p.m.
Closed on Saturday, Jewish holidays, January 1st and August 15th.